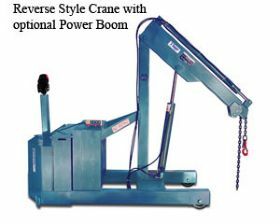 Full-power floor cranes feature powered travel and lift functions with infinite variable speed control. Completely self-contained hydraulic system with built-in overload relief valve. Built-in flow control valve permits pinpoint control over lowering and holding all loads. Manual extension boom standard. Heavy duty load and drive wheels with roller bearings and grease fittings. Swivel hook with safety latch. Adjustable legs on models HFP-2A and HFP-3A. Options include Hour Meter, Powered Boom Extension and Pendant Control. Contact dealer for options information. FOB Shipping Point. Ruger®Floor Cranes offer outstanding value, productivity and efficiency. They are highlly reliable and durable, a perfect fit for constant use environments and industrial applications. Ruger® products have offered dependable perfomance for over 60 years. Made in USA. All Ruger® Floor Cranes are tested at 150% structural overload of maximum rated capacity and meet or exceed ANSI and ASME PALD standards.